Jockum Nordström, I’m a Failure, 2011. 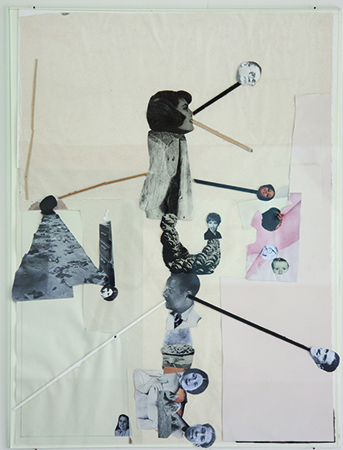 Collage on paper, 86.5 x 64 cm. The Contemporary Drawing Prize of the Daniel & Florence Guerlain Art Foundation was awarded on the 26 March 2015 to Jockum Nordström. Jockum Nordström was born in 1963 in Stockholm, where he still lives and works. He studied at the College of Arts, Crafts and Design, in Stockholm, and his works are now in the collections of MoMA, New York, the Hammer Museum, Los Angeles, the Moderna Museet, Stockholm, and the Musée national d’art moderne-Centre Pompidou, Paris. In France, his works were also exhibited at the Swedish Cultural Institute, Paris, and at the LaM, Villeneuve d’Ascq in his solo show All I Have Learnt and Forgotten Again (2013). He is represented by the Magnus Karlsson, Anthony Meier, Zeno X and David Zwirner galleries. The international jury was composed of Alexandre de Coupigny (France), Henri Griffon (France), Michèle Guyot-Roze (France), Anibal Y. Jozami (Argentina), Don Kaul (United States), Heidi Schwab (Switzerland), Luiz Augusto Teixeira de Freitas (Portugal) and Daniel and Florence Guerlain. The Contemporary Drawing Prize is reserved for both French and foreign artists, whether they live in France or not, but who sustain a privileged cultural link with France (through exhibitions, studies, etc.) and for whom drawing constitutes a significant part of their work, whatever their main mode of expression may be (painting, sculpture, photography, etc.). Awarded for the first time in 2007 and biennial until 2009, the Prize honours artists who make any unique work on paper or cardboard, using graphic means: crayon, charcoal, red chalk, ink, wash tint, gouache, watercolour, pastels, felt…including collages and wall drawings but excluding computer and mechanical processes. The award ceremony took place in Paris at the Salon du Dessin at the Palais Brongniart, Place de la Bourse. The winner received an endowment of 15,000 Euros and the two other selected artists, Tomma Abts and Pavel Pepperstein, received 5,000 Euros each. A work by the winner is offered by the Foundation to the Graphic Arts collection of the French National Museum of Modern Art—Centre Pompidou. The candidates are selected by a committee composed of the two founders, Daniel and Florence Guerlain, and of four members chosen for their competence and interest in contemporary art. Following a working meeting with the artists, visits to studios and analysis, the committee selects three artists whose work is presented to a jury, which changes with each prize and is responsible for choosing the winner. The Drawing Prize is sponsored by “Le Cercle des Amis,” Neuflize OBC, Guerlain, Artcurial, Axa Art, Loticis, Le Chêne vert, the Salon du dessin, L’École des Beaux-Arts de Paris, Château Seguin, Voisins Consulting and Champagne Bruno Paillard.